Explore the history of this culinary icon of New Orleans! Author and culinary historian Poppy Tooker combines family photographs, stories, and recipes from Pascal’s Manale into a collection that is much more than a cookbook. Tooker’s exploration into the storied Uptown restaurant, one of the “jewels in New Orleans’ culinary crown,” reveals the history of the family behind it and their influence on the city’s culinary culture. In contrast to the chef driven French dishes of the Creoles, Sicilian cuisine came straight from mama’s kitchen just as the signature dishes on the tables of this beloved eatery. 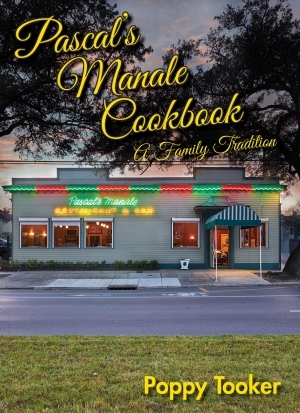 A bastion of Italian cuisine in New Orleans, recipes for Pascal’s Manale’s best-known dishes, including their famous barbequed shrimp, stuffed artichokes, and meatballs have fed their fans for over a century!